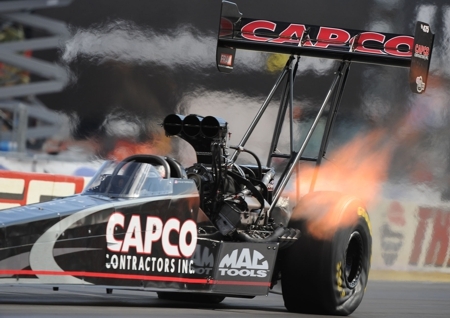 April 23, 2012 -- Anyone who chooses to own an NHRA Top Fuel team can do so. But they should realize that just because you own one doesn’t mean you will be competitive and win races. Steve Torrence and his family were well aware of that caveat last year when they created their own Top Fuel team. He hooked up with veteran crew chief Richard Hogan and they worked diligently to get the race car on the track in time for last September’s Full Throttle Series race at the Texas Motorplex in Ennis – the closest track to the Kilgore, Texas-based owners. The efforts of Torrence and Hogan, and their shrewd approach to this complicated project, have reaped rewards almost from the first time Torrence was strapped into the black dragster’s snug driving compartment. Now, as they approach their ninth race and sixth of the season, the Torrence Racing/Capco Contractors Inc. team has proven it is capable of winning races. And what better place to start than at their other “home” track near Houston? The O'Reilly Auto Parts Spring Nationals begins its three-day run Friday at Royal Purple Raceway in Baytown. “We are very happy to race there because we will have a lot of support from all the Capco people and our fans who will be cheering for us,” said Torrence, who earned a career-first number 1 qualifying position two weeks ago at Charlotte. It was quite an accomplishment considering he's competing against veteran drivers and multi-car teams. He was timed in 3.799 seconds. He won his first-round 4-Wide race with a time of 3.797 seconds at a career-best 322.50 mph, but fell from contention in the second round due to a motor malfunction. He’s also seventh in series point standings. He was the first driver to leave the line in both of his rounds with reaction times of .050 and .045-seconds.